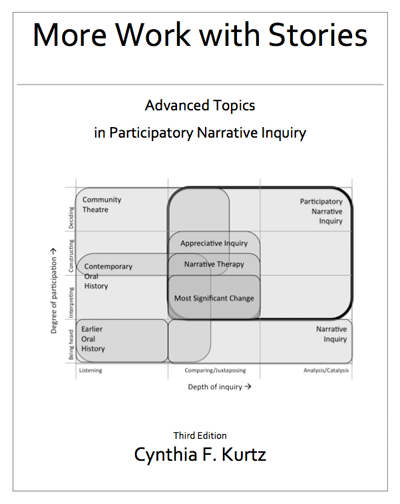 Working with Stories has a companion volume — More Work with Stories: Advanced Topics in Participatory Narrative Inquiry. As the name implies, the second book covers advanced topics such as where PNI came from and what it takes to be a PNI practitioner. If you are a professional story worker, or you want to be one, More Work with Stories is for you. As of mid-2018, the second book still isn't finished. I had originally intended to finish it right after Working with Stories was done, but I couldn't face another six months of editing and formatting. So instead I veered off into other projects: NarraFirma, Narratopia, and a book of essays on commercial and conversational storytelling. I do hope to come back and finish More Work with Stories someday, but right now it doesn't feel like an urgent need. If you want to read the second book, you can read it online, and I'll get around to making it pretty eventually. If you do read the second book, please send me feedback so I can improve it before it's published. These are descriptions of some newly forming prototype exercises, or variations of existing exercises, that I've been working on since finishing Working with Stories. They will be incorporated into the second book (or into, gasp, a fourth edition of WWS) when that happens. Ground truthing exercise - In this exercise, people juxtapose parts of a document with stories of their experiences. The comparison helps them evaluate and improve the document. Sticker stories exercise (PDF, DOCX) - A lightning-fast version of a sensemaking landscape exercise, done with printed sticky-note stories, to get people working with collected stories in a short time frame. Local folk tales exercise - An imaginative exercise for families, workgroups, communities, and organizations in which people explore their common identity, context, and purpose by sharing real and fictional stories about things that can and can't and should and shouldn't happen. Story-ended Questions Workshop (PDF, DOCX) - An hour-long workshop in which people (a) learn about conversational story sharing and (b) practice eliciting stories and supporting story sharing. © Cynthia F. Kurtz. All rights reserved.